Update: WatchOS 5.2 has now landed - read on below for all of the details on the latest Apple Watch software. Apple launched the final version of watchOS 4 and moved onto watchOS 5 in September 2018 alongside the launch of the Apple Watch Series 4, but you may not have been educated on all of the software's features. We liked watchOS 4, but there was plenty of room for improvement, and we saw it with watchOS 5. Below you'll find all the information on the new fitness elements, the latest features as well as details on whether your watch is compatible. Since then, we've seen Apple slightly change its software with watchOS 5.1 and watchOS 5.2 too. So settle in and read on for everything we know about the Apple Watch's latest big software upgrade. Apple announced the next-gen software at WWDC 2018 in June and as expected i was titled watchOS 5 to follow on from watchOS 4. It's now available as a free update, and you can now download it to your watch. 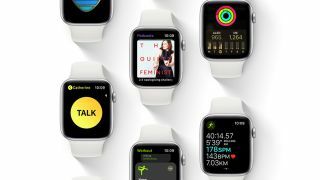 Open the guide just below to learn how to upgrade your existing Apple Watch as this is a little more complicated than upgrades to iOS 12 for your iPhone. The latest version of the software is called watchOS 5.2, and we may see watchOS 5.3 land later in the year ahead of watchOS 6. Own an original Apple Watch? You won't be able to download watchOS 5. This is the first time Apple hasn't made its software upgrades available to all generations of its wearable devices and you'll need an Apple Watch Series 1 (that's the updated device released in 2016) to be able to download it. You'll also need to have an iPhone 5S or later with iOS 12 onboard to be able to download watchOS 5 and you'll need iOS 12.2 if you want the latest watchOS 5.2. The main feature of the Apple Watch 4 is an electrocardiogram monitor, which helps you track the risk of atrial fibrillation that has been linked with a variety of heart problems. The feature wasn't on the watch immediately at launch. Those in the US had to wait until watchOS 5.1, and watchOS 5.2 has now brought it to further countries. Those in the UK, Hong Kong and 18 European counties are included in that latest update. We've yet to learn when it'll be coming to other markets, such as Australia. If you don't have an Apple Watch 4, earlier models of the Apple Watch will still get access to an Irregular Rhythm Notification feature that may give you a clearer picture of your overall heart health. Find your workouts go better if you're competing against someone? The new upgrade to the Activity app on Apple Watch is right up your street. You can now start seven day activity competitions directly within the app with another Apple Watch wearer. You'll both be competing against each other to see who can earn the most points and close the most Rings in the Activity app over a week long period. The app will send you coaching notifications for advice and reminders to get ahead of your competition during the week long period. Then whoever wins at the end of the seven day period will get given a special medal within the Activity app. The Workouts app on Apple Watch also got a few big upgrades including automatic workout detection for what Apple calls the "most popular workouts on Apple Watch". It means you can start your workout and you'll get a notification from your wrist asking if you want to start an activity within the Workouts app. It'll retroactively remember what you've done before you press yes, and then start the workout for you. At the end of the workout, you'll be nudged by your wrist to end it too. It does this by monitoring your heart rate and realizing you've slowed down and have probably stopped. What workouts are getting this feature is currently unclear, but we know it's coming to Outdoor Running. Both Yoga and Hiking are joining the 12 other activities within the Workouts app too. For both it'll be tracking the amount of calories you've burned at the exercise minutes you've earned. Runners will be excited by some other new features in watchOS 5. Cadence is coming to the Apple Watch for both indoor and outdoor runs and walks. For the uninitiated, Cadence is the amount of steps you've taken per a minute. That's a useful stat for high-performance runners and is something a lot of dedicated running watches specialize in. There's a new pace alarm for outdoor runs within the Workouts app that'll nudge you if you're ahead or behind of your pace, which again will be useful for a lot of running fans. Rolling mile pace is a brand new metric for the Apple Watch too and it'll be an option to show the pace for your previous mile as well as your average pace or current pace. Then if you own the Apple Watch 4 and live in the US, the watchOS 5.1.2 update will mean you can access the ECG app on your watch. An ECG is an electrocardiogram reading, which is a tech that will detect the likelihood of you suffering from atrial fibrillation that can lead to heart issues. This is the first consumer device to offer the feature, but at the moment it's just for those in the US. It's expected a future watchOS update will bring the feature to other markets. Fitness is the biggest area to be upgraded in watchOS 5, but there are lots of other features coming in the update too. There's a new feature in watchOS 5 called Walkie-Talkie that'll allow you to speak to a friend who also has an Apple Watch. You'll be able to set it up with anyone in your contacts who has an Apple Watch set up, and once you've connected they'll be able to send you a message at anytime when your watch is on. The Walkie-Talkie feature will send a vibration through to the other person's wrist and then play your message, much like a normal walkie talkie would in real life. It'll work on both Wi-Fi and mobile internet, so it's not just limited to the Apple Watch 3 LTE. This feature got a lot of cheering on stage at WWDC, but one interesting thing is that Apple originally announced this feature back in 2014. It just never released the feature on the original Apple Watch. What has changed here to mean Apple wanted to include it in watchOS 5 is unclear, but it's a fun feature for people to play around with. The Siri watch face gets a few upgrades in watchOS 5 that are meant to show more useful shortcuts throughout the day at different times. These vary from the time you should leave for your commute or your heart rate after a run, but the idea here is that Apple wants the Siri watch face to become an evolving hub for your wrist. Third-party apps also came to the watch faces too. We've seen apps like Citymapper, Nike+ Run Club and Lose It appear on stage, but there are going to be lots more coming soon. Apple didn't announce the rumored third-party watch faces for watchOS, and instead the company is focusing on this Siri watch face integration from third party apps rather than allowing others to make watch faces. The new Siri Shortcuts feature announced as part of iOS 12 also came to the Siri watch face too. Plus on top of that, you'll also now just be able to raise the watch and speak directly to Siri. That means you won't need to say "Hey Siri" to activate it. There's also a new Pride watch face to match the Pride watch band from Apple, which you can download today onto your Apple Watch. The Podcasts app is finally on Apple Watch. You can stream Podcasts directly to your wrist by speaking to Siri and if you want to have them downloaded you can set it up so the latest episode of your favorite show will sync up on your Apple Watch. That's a big deal if you're planning to ditch your iPhone for long periods of time and need to listen to audio from your wrist. Developers are also getting a new feature that allows music, audiobooks and meditation sessions to be synced to the Apple Watch for offline playback. Perhaps that means we'll see more third-party apps allowing you to listen to audio without a connection in the future. Apple is also allowing third-party music and podcast apps to play audio in the background while you use another app on your wrist. It means you can keep listening to a podcast with that new Podcasts app while messing around in Apple Pay or reading some messages on your wrist. It's also worth noting the rumor of Spotify coming to the Apple Watch didn't come to fruition at WWDC 2018. Whether that was all a big misunderstanding or something went wrong so the company didn't announce it, we probably won't ever know. Back to messaging apps, and web content is now available in your messages on your wrist. That means if someone sends you a link in an iMessage you'll be able to see a small preview of how it appears online. It won't be lots of information, but it'll give you an idea of whether you need to open it up on your phone.